ONSTAGE, TWO thirty foot trucks worth of amps were stacked in a chrome and black wall across the back exactly and appropiately as for Ted Nugent. I'd come panting in half way through the first number, "Hear Me Calling' and already the crowd was on their feet and yelling. But poor old Slade have blown it, have they? Oh no. They Hadn't got but a few bars into "Get On Up" (from 'Nobody's Fools') before all the preconceptions had been laid to waste by a band producing music from the premiere league of excitement. 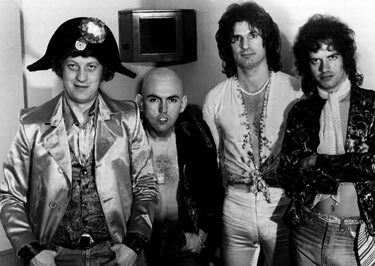 Noddy's napoleon outfit and Dave Hill's newly Kojaked bonce suggested the same old harmless pop gimmickry approach. The music suggested havoc. It was sensational: a riff as pile driving as anything Quo have produced with the distinctive fuzzed, rough texture of the Slade guitars and a hint of American funkiness working through. Compulsion. I could hardly believe it. 'Be', from the new album was next and it must be the most difficult thing they've ever attempted. The guitars said their piece, then Noddy and Jimmy Lea in miraculous unison tore through a tongue twisting lyric at impossible speed. A guy in front of me couldn't punch the air fast enough with one hand so he was throwing combinations. You just had to get it out like that or bellow something non specific but appreciative: "Yah, Slade you motherfuckers!" Dynamics, dynamite. These first three numbers were magnificent and the rest of the set, including some of the old hits, couldn't quite stay up there I felt. The crowd didn't agree with me though and neither did Noddy. They were on their feet and singing 'The Blaydon Races' while Noddy in total friendly rapport squawked away like a cross between Mr Punch and schnozzle Durante. In fact, 'Gudbuy T' Jane' stood the test of revisiting best, with its combination of speed, heavy rock, compulsive hook line, full of ideas that they have developed further in their new material with 'Lightnin' Never Strikes Twice' and 'The Soul, The Roll And The Motion'. Their rhythms are still colossal and they have all come a distance as players. 'Lightnin' especially on the revelation with Dave Hill's guitar harmonising with the vocal then Noddy counterpointing him on his own guitar. And this amid all that barmy excitement. I expect Slade will be the Status Quo of 1987.